We recently built a rather unique custom cabinet for a customer with stores located in northern Wisconsin. The cabinet displays and sells 50ml-size mini liquor bottles (the type sold on airplanes). As we were building it, we realized that this could be a new trend. A collection of these small bottles makes for a great party gift, as well as being quite practical to purchase for your own cocktail party needs. The 50ml size is slightly more than 1 shot glass (which is 1.5 oz). This single-serve size helps control alcohol intake, providing yet another form of party benefit. And of course their original use by airlines speaks to the ease of use and value of these bottles for traveling purposes. Individual bottles are placed into separate bins by brand/type, making for an organized display and fun customer selection process. 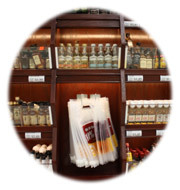 The cabinet also has a separate center opening where customers grab “to go” bags to put their bottles into. It really is a pretty slick idea – and display. This idea might be something unique for you to consider adding in your store. Contact us if you are interested.